Organizations are investing in Enterprise Planning Solution (ERP) systems to streamline their operational processes. But even if organizations are considering ERP, they fail to implement it successfully. According to the ERP Report 2015 of Panorama Consulting Solutions, 21% of companies have mentioned their ERP projects as failures compared to 16% in 2014.This may be due to ineffective training. So, what is the ideal method for imparting ERP training? The answer is eLearning simulations with ‘Watch-Try-Do’ approach. 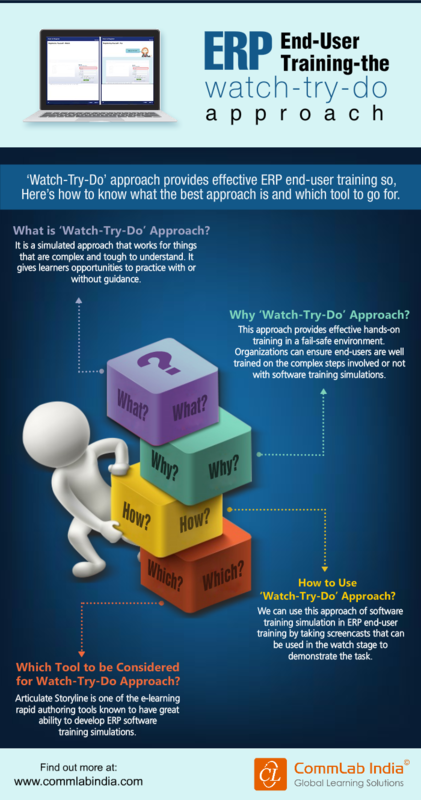 Excited to know what the ‘Watch-Try-Do’ approach is, how and why it is suitable for ERP training? Then, please check out the infographic below. End-User Training (EUT) – An Option or a Must for Successful ERP Implementation?